I went to my husband's cousin's wedding on Saturday in NY. Although it was a great time they did things a little differently so I thought I would share what it was like. Ceremony and reception were all at the Hilton Hotel. We checked in and received a great box of goodies; animal crackers and water bottles were some of the items inside. The invitation said 6:30 so we walked down to meet family. From 6:30 -7 we all met in the hotel lobby for champagne, We were all standing around not sure what to do. Then they moved all 300 of us into a ballroom for the ceremony at 7. The grooms family and groomsmen stood on the left side and brides on the right, I haven't seen this before. Even the bride was confused, when she walked down the aisle she stepped right to the left side and her MOH had to move her! Cocktails which included so much food we could have considered this dinner were from 7:30-8:45. There was a raw bar, Asian station, lamb chop and turkey carver, pasta bar with calamari, mini hotdogs and hamburgers with french fries! I had to keep reminding myself there was dinner later. 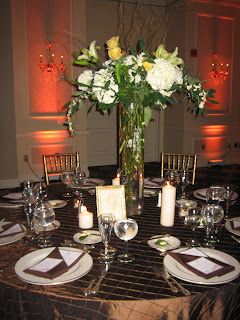 Then we went into the ballroom, beautifully decorated with brown pin tuck linens, tall centerpieces with hydrangeas and lillies and lots of candles and uplighting. The staff was just wonderful, took our order (Seabass, filet or stuffed chicken) and brought salads out around 9:45. There was a lot of dancing then eating then dancing and we didn't get served our entree until 11pm!!! The DJ rocked until 1am! Now this DJ was different then any other DJ I have seen as well - part of the set up included a drummer who played along with the songs! So are you seeing a lot of late night weddings? Is the trend to switch brides and grooms sides for the ceremony? Do you like the idea of a drummer with the DJ? All NY weddings tend to run later than around here. Re: switching the bride and groom side, are they Jewish? It would make sense if they are.